Today, I am a very happy dude. I've been looking for a 1975 HK91 for sometime, and a week or two ago, I found one. Near immaculate condition. My blue-grey '83 is in very good shape, but this thing is near perfect. Just a slight amount of wear at the ejection port, and it looks like maybe someone had a claw mount on there at some point, but its hard to tell. My '83 isn't built as well, either. With the stock trigger housing, there is just a slight amount of play. If you grab the forend and pistol grip and "stretch" you can feel the trigger housing moving around just a smidge. To solve that I used a different lugged trigger housing, so that the rear pins keep things solid. The '75 is set up identical to the factory '83 set up: the front shelf and the rear, unlugged tang -- but it locks up tight with no play. I swapped out the factory plastic wide handguard and stock for a collapsible stock and slim hand guard I had around, because this rifle is coming with me into the woods next weekend for sure. @AGG - or anyone - is there a way to tell what month it was made, by any chance? Maybe the serial? Or should I just call HK? Just kind of curious, because it was born the same year I was. GuntherRommel and AGG like this. Good find. I had a mid-70s 91 with standard stock, telescoping stock, extra wood stock and fore-end, front (light) bipod, claw mount, and lots of other stuff. All brand new at the time. It's a heel of a good rifle. My consolation is that it is still in the hands of a better man of action than I am. Yup. The HK91 is one of my favorites. Don't see myself ever selling one. This 75 will be my shooter, and my 83 will get the PSG1 treatment sooner or later. Heck, I could see myself picking up another G3 type at some point. There isn't much left on my radar of stuff I want, so sometime in 2020 or 2021 if I were to run into one of those old '60s "Santa Fe" G3s ? It's probably coming home with me. Truth be told, I feel kind of guilty having three G36 type rifles around, and only two G3s. My pops always told me to respect my elders. As you can see, there are very few "1975" samples--- I would bring this back to original configuration, and put this one away as a collectible. Thanks Tony. I will definitely be taking good care of this rifle, but she deserves to let her hair down and get shot some. I know there weren't many imported in 1975 -- elsewhere I found it reported that 300 were imported that year. Like I said, I've been looking for one for awhile, and didn't really think I'd ever find one. That is the reported number--- unfortunately, I have no numbers between 011596 ("1975") and A012271 ("1976")!!! When did HK switch to the lettered date code system? Are there date-coded '76s? 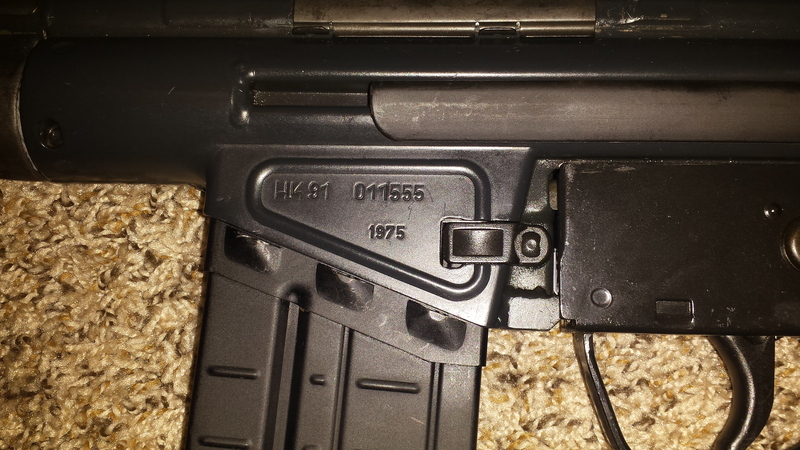 I have a HK93 date coded to 1977. Just curious. Congrats OP. With my first HK91, I ended up having it chopped up into an HK 21 by RDTS which never ran right than sold it :(. Than finally PTR came out with the 91 clone and installed one of my Fleming sears and have shot thousands and thousands of .308 flawlessly thru it. I finally came across an HK 91 LNIB and it's almost a ocean blue/green color to it. 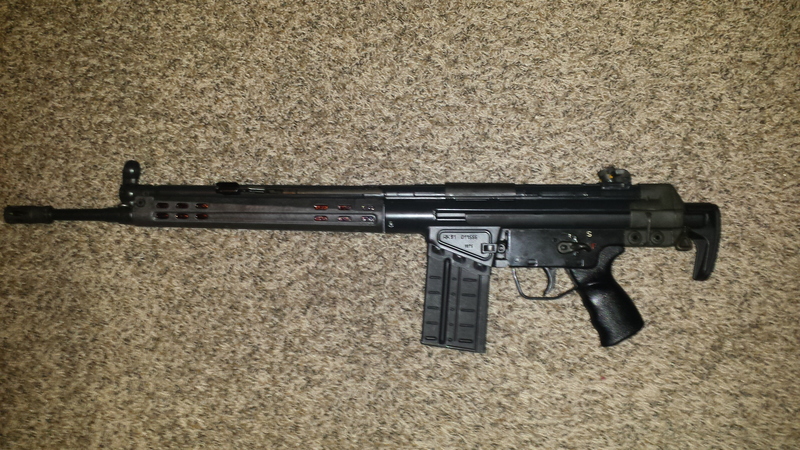 Got it all pimped out with factory HK swag and a .22lr conversion kit to boot. Of all my 70+ pieces including 7 MG's, my HK 91 is close to my heart! That's exactly the way I have my 66 41 configured, except with the older style A3 stock. Makes for a nice compact 308.